Computers are amazing educational tools, but they can also be a huge distraction to learning. The Internet, instant messaging, email and games are a constant temptation for students. And instructors often struggle to capture students' attention when using computers to teach, either because the screen is not clearly visible or because the students' opportunity for interaction is un-coordinated. LanSchool removes distractions and facilitates collaboration so that instructors can teach more effectively. No classroom management solution is simpler to install, easier to use or better suited for teaching in a computer-based classroom. LanSchool is not only easier to use, it is technically superior to other similar products. LanSchool uses IP-multicast technology, which means that the data is sent only once over your network, reducing bandwidth utilisation significantly. And for screen sharing, LanSchool uses a Microsoft-certified mirror driver, virtually eliminating system hangs. Other classroom management solutions are poorly implemented from a security perspective. LanSchool uses the concept of 'channels' whereby an instructor presents their class materials on a single channel and only the machines in that classroom may access the channel. Conversely, the student machines are bound to a single channel and cannot access other instructors' channels. Rogue machines on the same network cannot gain access to the channel without the required password credentials. 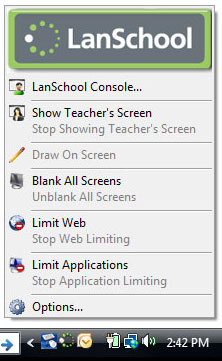 LanSchool is software only and supports any combination of computers running any version of Windows on wired and wireless networks. Mac is supported for student machines running OS 10.4 or later (using either PowerPC or Intel hardware). Indicative pricing: US$ 300-600 per classroom, depending on volume (campuswide licenses are also available). This is a perpetual license which includes 3 years of upgrades & email support from LanSchool. Onsite and phone support is available from Iterate for the 1st year, and it may be renewed annually. And for a limited time, LanSchool is bundled with Tech Console.